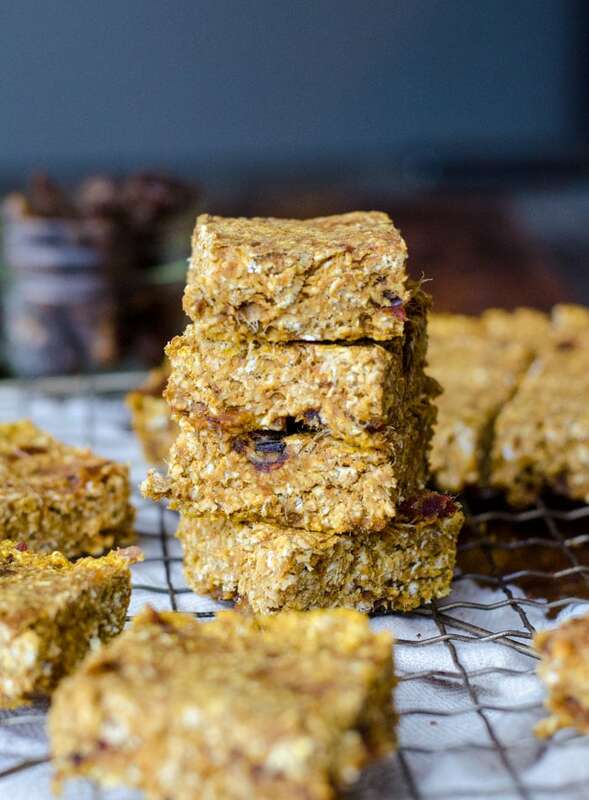 These vegan and gluten-free, Baked Pumpkin Oatmeal Bars are made with just a few simple ingredients and are the perfect quick snack for Fall mornings. All you need to make them is oats, dates, pumpkin puree and pumpkin pie spice. So easy! Dates provide natural sweetness and hints of caramel that pair beautifully with pumpkin and pumpkin pie spice. Try cutting them in half and making an almond butter or coconut butter sandwich, or warming and topping with coconut whipped cream or non-dairy yogurt. 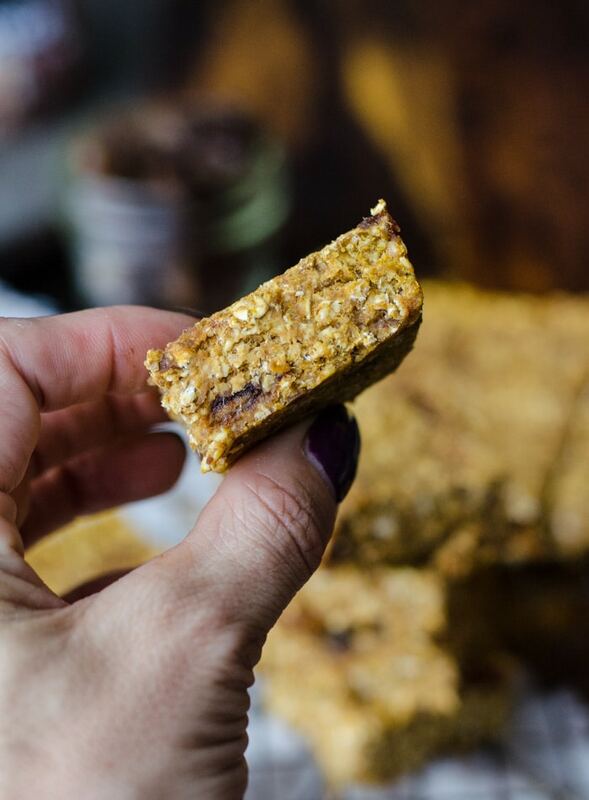 However you enjoy them you’ll love simplicity of these healthy baked oatmeal bars. I like to keep my recipes as simple as possible because I don’t know about you guys but when I’m browsing cookbooks or recipe on Pinterest, if the ingredients list is too long I’m like, see ya! To be honest, I’m lazy, and pretty cheap when it comes to ingredients and sometimes I need baked pumpkin pie oatmeal bars like yesterday. 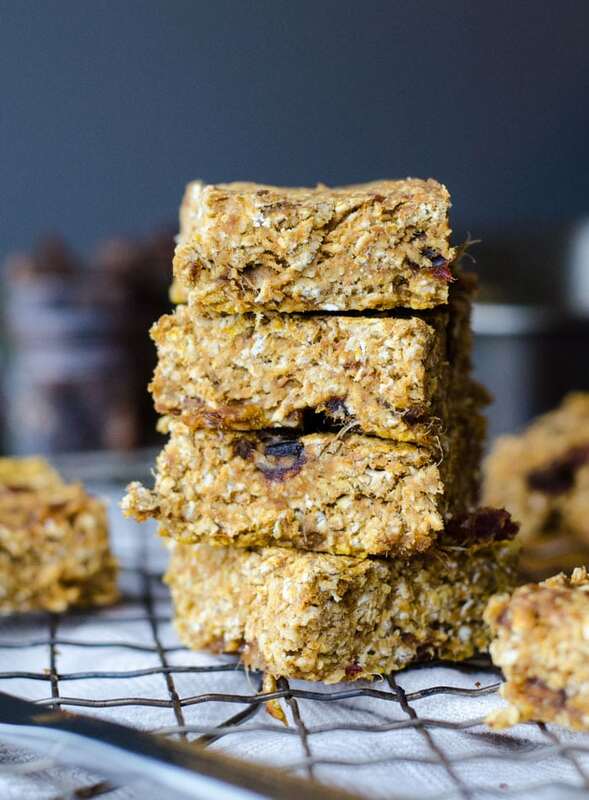 There were a lot of ingredients I thought about adding to these: ground flax, almond butter, chocolate chips and chia seeds all crossed my mind but when it came down to it, I knew the recipe would work and still taste delicious with just a few basic ingredients. 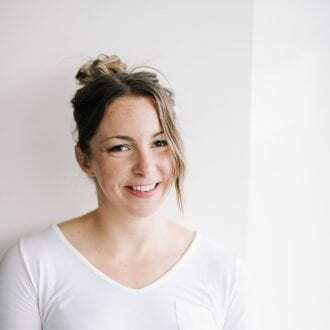 I also like to keep my recipes as accessible as possible, meaning you would typically have the ingredients on hand already and if not, they’d be easy to find. So these bars are nothing fancy, nothing elaborate and nothing decadent. They’re a basic, healthy, functional, wholesome snack made with just 4 simple ingredients. Now, if you want…and I’m sure some days I will too (hello, chocolate chips), you can go ahead and take these up an notch with additional add-ins. I usually use prepared pumpkin pie spice as I find it so much easier than adding cinnamon, nutmeg, ginger, cloves and allspice to all my pumpkin recipes. However, pumpkin pie spice is really easy to make, so you can always make a large batch and use that if you don’t feel like purchasing it prepared. To make a batch of pumpkin pie spice to use in this recipe, combine 3 tablespoons ground cinnamon, 2 teaspoons ground ginger, 2 teaspoons ground nutmeg, 1 ½ teaspoons ground allspice and 1 ½ teaspoons ground cloves and then use 2 tsp of that mixture. You can also just add the spices individually to the recipe, in which case, use 1 tsp cinnamon, 1/2 tsp ground ginger, 1/4 tsp ground nutmeg, 1/4 tsp allspice and 1/4 tsp ground cloves. If you’re missing one of those spices, don’t worry about it too much, just add a little extra cinnamon and you’re good to go. To sweeten these bars, I used 1 tightly packed cup of dates, finely chopped and soaked in hot water. To soak them, just place them in a bowl, pour boiling water over them, let sit for 15 minutes then drain. I like using dates an unrefined, natural sweetener since they add fibre and nutrition along with their natural sweetness and caramel flavour. The dates did not result in a super sweet bar so if you want the bars to be a bit sweeter I would recommended adding about 10-20 drops of organic liquid stevia to bump up the sweetness. warm them up and top with coconut whipped cream or non-dairy yogurt – hello healthy pumpkin pie! Those are just a few ideas! What other ways can you come up with to enjoy these bars?? These bars are just 99 calories each with just 1.3 grams of carbs and just 1.2 grams of fat. Each bar contains 2.6 grams of protein and 2.8 grams of fiber. 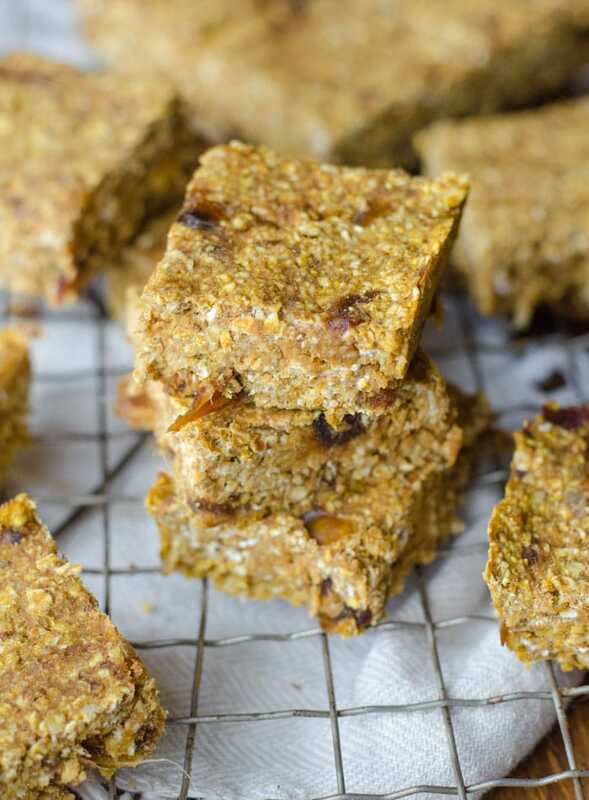 Thanks to the pumpkin, they’re an excellent source of vitamin A.
I hope you enjoy these simple, Fall-inspired baked oatmeal bars. Let me know if you add anything to yours and how they turn out! 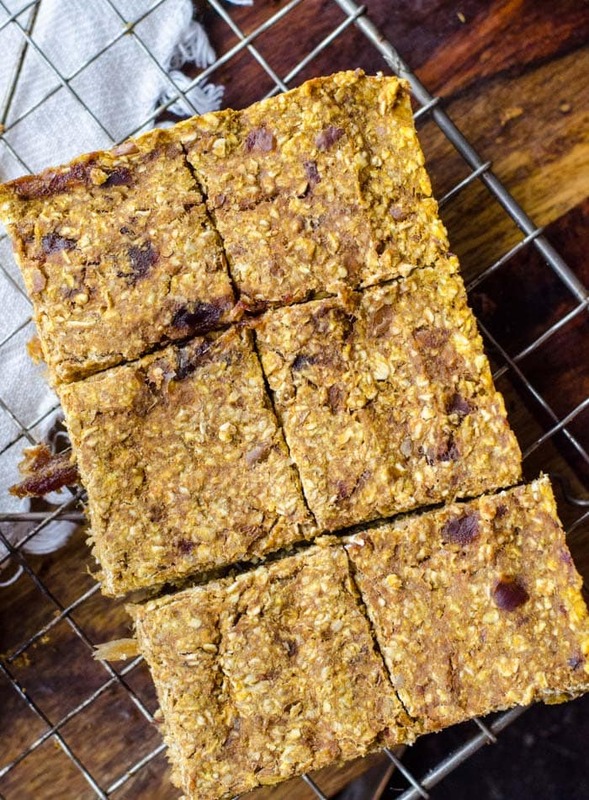 You only need 4 simple ingredients to make these wholesome breakfast bars: oats, pumpkin, dates and pumpkin pie spice. These make a healthy, quick breakfast or snack and can even be enjoyed for dessert. Try them warmed up with a dollop of almond butter or coconut butter on top. Chop of the dates, place the in a bowl, pour boiling water over them and let sit for 15 minutes before draining. Add all of the ingredients to a bowl and mix well to thoroughly combine. Lightly spray a square baking pan with non-stick cooking spray then firmly press the dough into the pan. Bake for 12 minutes then let then cool completely in the pan before cutting into 16 squares or 8 large bars. If you don’t have pumpkin pie spice use 1 tsp of cinnamon and 1/4 tsp each of ground ginger, nutmeg, allspice and cloves. No worries if you’re missing one, just add a little extra cinnamon. I recently completed a long elimination cleanse to transition into a completely plant-based/ SOS free diet. So satisfying, slightly sweet & decadent but not too rich.. and so versatile. I made a 1/2 batch on Tuesday & another this evening. I am so grateful to have found your site! Thanks so much for trying them 🙂 I’m so glad they worked out for you!! I love these too. The perfect healthier dessert option. Happy plant eating!